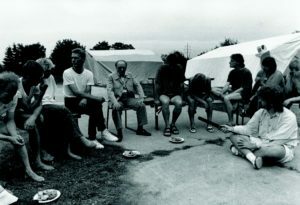 The AG Neuengamme (AG – study group) was founded on June 6th, 1948 as an advocacy group for the former German political prisoners, their relatives and surviving dependants. 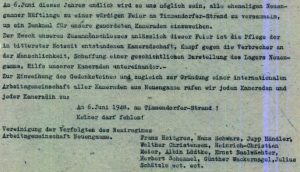 It fostered communication between survivors of the Neuengamme concentration camp and supported former resistance fighters and other persecuted peoples of the Nazi regime. The AGN advocated for the juridical punishment of Nazi perpetrators and collected documents about crimes committed in the CC Neuengamme and its satellite camps. It fought against the neglect and denial of Nazi crimes in post-war German society and for recognition and compensation of the victims. For decades it demanded the construction of a dignified memorial in Neuengamme and its former satellite camps. In 2011, we lost our honorary chairman, Fritz Bringmann, the last former prisoner who was active in the AGN. For Fritz Bringmann, it was very important that the AGN be open to all – to both commemorate the memory of the victims of the Nazi crimes and to consciously fight against the rebirth of Nazism in the future. Today, the AGN is organized by relatives of former inmates and other persecuted peoples as well as members of the public who want to preserve the legacy of the survivors of the Nazi camps. The AG Neuengamme (co-)organizes commemorative ceremonies in Neustadt (Holstein), Hamburg-Wandsbek and Neuengamme. We stand up for the renewal of remembrance and support new initiatives at other sites of Nazi terror. Through performances and lectures, we remember prisoner groups and prisoners of the CC Neuengamme, and we organize performances on topics like the lack of compensation for specific victim groups, cases against Nazi perpetrators and the politics of remembrance. In cooperation with different organisations of persecuted groups and antifascist initiatives, we are developing a commemoration that criticizes and attacks the ongoing turn to the political right and neo-Nazi terror in Germany. We stand against any attempt to deny or minimalize Nazi crimes or their utilization for political gain. We want to shine a light on the traces of National Socialism that continue today in German society and make public the family history of the children and grandchildren of resistors and the persecuted. 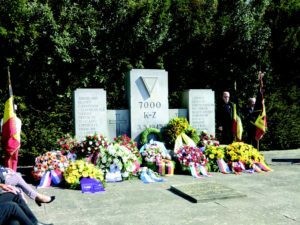 Commemoration in Neustadt at the Cap Arcona Memorial, May 3, 2014.